I did a series of point counts for Dan last week because the rainy weather had caused him to lose a number of field days, and time was tight before the move. Although Dan has done a number of hiking transects through the park, the point counts I did were all roadside. I started at one end of the route, and then stopped and counted birds at 500 metre (547 yard) intervals for about 13 kilometers (8 miles). I saw and/or heard a number of neat species along the route, but didn’t pull my camera out for any of them, because I was on a tight timeline to fit all the counts in before 10 am (an arbitrary cutoff set to keep counts standardized, as birdsong generally slows down by mid-morning). 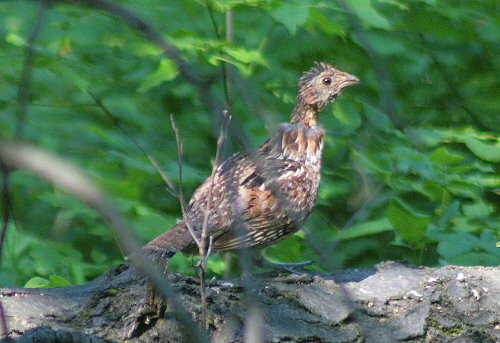 At one stop, though, I just couldn’t resist running off a few photos of a trio of Ruffed Grouse that popped up at the road edge. They looked like young birds, not quite sure of themselves yet, but still curious about the world, a little scruffy at the edges, though they could just as easily have been moulting adults. 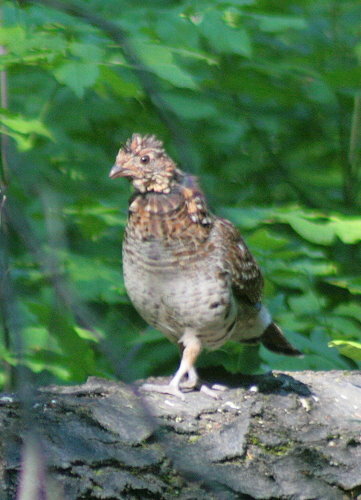 Dan and I have startled a number of grouse families over the last few weeks; the species is certainly doing well around here. Previous Previous post: Scheduled post: Moving day!